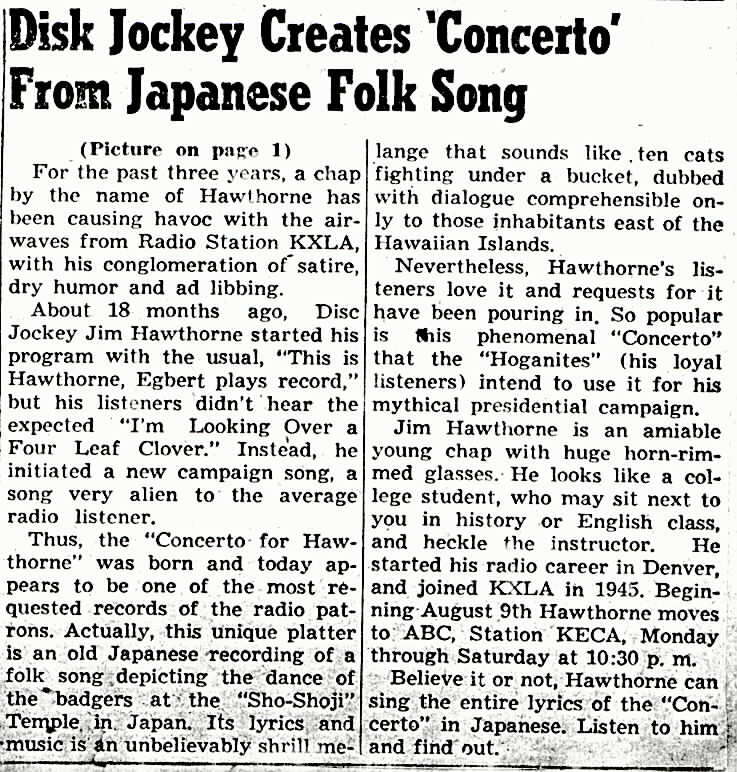 Hawthorne made a few records in the late 1940's and 1950s, some of which still enjoy airplay today on the Dr. Demento show. The following is a list of the records he's made (that I know of). A few interesting unissued discs have just surfaced in March of 2003, courtesy of Hoganite Dave Stuckey, which are instrumental recordings of his theme songs and most often played hits. These are presumably studio discs and have yet to be fully explained. There are presumeably more records that I have yet to find, and when I do, they will be posted and pictured here! Recording dates and locations are also unknown to me, but if I can find them out, they will be posted. A couple of these tracks are now available on CD, see below for more information. I highly recommend buying these CDs as soon as possible! I was lucky enough to have Hawthorne sign my 78rpm records (and sheet music) you see here, some on the label, others on the sleeve. The Unnatural Seven, vocal by Karen Tedder and "Enrohtwah" and including members of the Pasadena Ukelele Society on Ukeleles. Hawthorne, with Ike Carpenter and the Royal Hoganites. This is a phonetically sung version of a Japanese song, "The Badger's Chorus of Shojoji Temple". "Turn Your Head Sweetheart (I Can Still See Your Face)"
Hawthorne with Ike Carpenter and his Orchestra. This novelty song of the late 1940's was also recorded by Red Ingle as "Turn Your Head Little Darlin' (I Can Still See Your Face)"
Slim Gailard, with barks by Hawthorne. Slim Coates and the Worth Twins with Hawthorne. 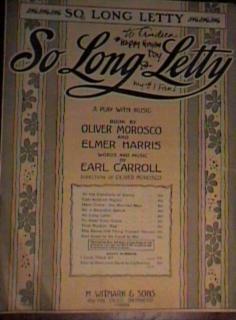 This song was written by Hawthorne and Coates, and also recorded by Slim Gaillard. 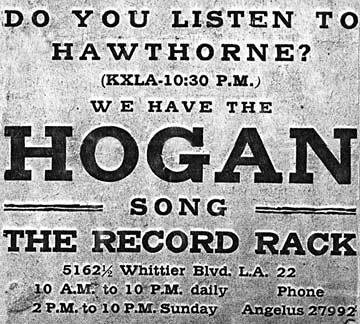 Hawthorne doesn't actually appear on this record at all, but he issued it under his own name to publicize it, since he owned Bingo Records. (A Capitol Record Reader), (Capitol 25021 & 25022. )Pinto Colvig (Bozo), music by Billy May. This is a children's two volume 78 rpm record/book that included an attatched illustrated booklet to read along with the discs. An uncredited Hawthorne plays the voice of the Swordfish, one of many aquatic friends Bozo the Clown meets on an undersea trip. Hawthorne's vocal contribution is the high point of the adventure, needless to say. "Henry and Emma, Parts 1 & 2"
It's Hawthorne with cartoon voice artist / pal Don Messick, doing a strange (even for Hawthorne!) comedy bit between sleepy husband and nagging wife, where almost the entire "B" side is the sound of Jim snoring! 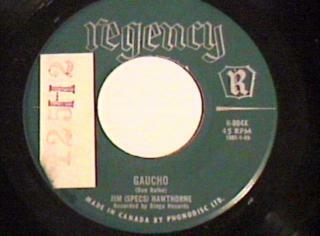 I finally recently found a copy of this record, and will post a picture of the label asap. Hawthorne recorded three other songs for RCA Victor which were not issued, including "Make Love with a Duolyka", and possibly "I Can't Stand The Mambo (But I Love It When The Band Goes Ughh!" I'm still trying to figure out how to add the audio on this page so you can hear these discs in their entirety. (Anyone who might be able to help please contact me.) There'll be more Hawthorne on records as information becomes available!